GMG ProductionSuite can print jobs as they are being processed, driving more than 800 different printing, cutting and CtS-devices. Consistent color rendering using different machines, materials and printing modes. Perfect handling of spot colors. Calibration and profiling with a single software solution, directly alongside the press. Extensive options for last-minute corrections in PDF documents – image and text. Intuitive tools for preparing printing data in a matter of seconds. Simple addition and editing of White and Silver channels. Practical templates for repeat jobs. Standardized and optimized prepress workflow for up to 50% time savings. Roughly 20% ink savings thanks to the integrated GMG EcoSave function. This option allows systems such as Fotoba, Kongsberg or Zünd to be added at the click of a mouse. The Industrial Cutting option provides all the tools necessary for integrated printing and cutting production. Laying out multiple small individual motifs on an output media in a space-saving way used to be a time-consuming process. With the True Shape Nesting option of the GMG ProductionSuite Editor, this now occurs fully automatically. 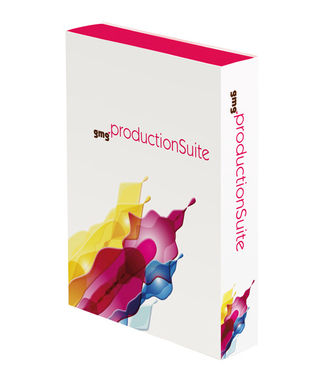 This option expands the functionality of the GMG ProductionSuite Editor with the option to integrate variable data records. This option allows different colorations of patterns through Colorways and the repetition of this patterns through the Step & Repeat function. The creation and printing of Interior Design applications, such as wallpapers or textiles are done with just a view clicks. All Editors on the license must be upgraded with the Interior Decoration option.